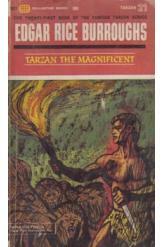 Tarzan the Magnificent by Edgar Rice Burroughs, Sci Fi. Book is in good condition, all pages intact. Two tribes of warrior women, the Kaji and the Zuli, war against each other over possession of a pair of magical gems. Amid the chaos, Tarzan the ape-man must perform a daring rescue mission without falling prey to the gems' power. Part of the Tarzan series.